North Korea: On 16 January North Korean media published a proposal by the National Defence Commission (NDC) of the DPRK for South Korea to take three steps to stabilize the peninsula. "1. We propose taking practical measures in hearty response to the warm call for establishing a climate for improved north-south relations. We officially propose the south Korean authorities to take a practical measure of halting all acts of provoking and slandering the other side from January 30, a day before the Lunar New Year's Day." "2. We propose taking a practical step of halting all hostile military acts against the other side in response to the historic call for defending the security and peace of the nation. So, we again propose immediately and unconditionally halting all military and hostile acts targeting the fellow countrymen in collusion with outsiders"
"For the present the South Korean authorities should take a political decision of canceling Key Resolve and Foal Eagle joint military exercises which they plan to stage from the end of February under the pretext of 'annual and defensive' drills." "If the 'coordination' and 'cooperation' with the U.S. are so precious and valuable, they had better hold the exercises in the secluded area or in the U.S. far away from the territorial land, sea and air of the DPRK. 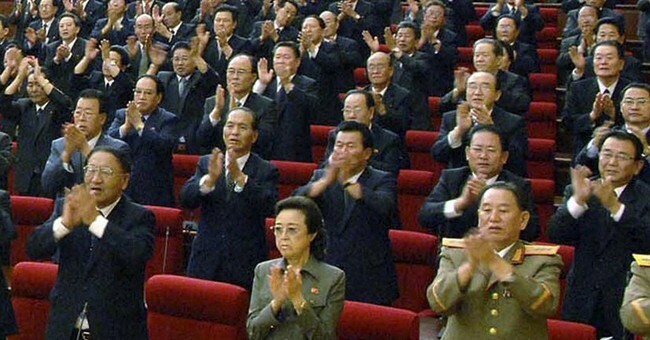 This is the stand of the DPRK." "We specially propose stopping all acts provoking the other side on the ground and in the sea and air including five islands in the West Sea, hotspots where both sides are in acute show-down, leveling their guns at each other. The DPRK side will show its practical action first for the realization of this proposal." "3. We propose taking a mutual practical measure to prevent a nuclear holocaust from being inflicted on this land. Our nuclear force serves as a means for deterring the U.S. from posing a nuclear threat. It will never be a means for blackmailing the fellow countrymen and doing harm to them." We courteously propose the south Korean authorities not to resort to reckless acts of bringing dangerous nuclear strike means of the U.S. to south Korea and to areas around it, taking this occasion as an opportunity….If these proposals are put into practice, it will be possible to settle all issues, big or small, arising in the north-south relations including the reunion of separated families and relatives. We express the expectation that the South Korean authorities will positively respond to our principled crucial proposals. Comment: In summary, the North wants all exercises in the South to halt beginning 30 January; wants all allied exercises to stop or take place in the US instead of South Korea; and wants South Korea to prohibit reinforcements from the US that include nuclear capable assets. The North's statement is a list of what it considers confidence building measures. The language is polite and the proposals are presented as "practical steps," meaning doable actions. In fact these actions appear aimed at driving a wedge between South Korean and its Allies, encouraging the South to choose better relations with the North over better defense capabilities with the Allies. What is missing is a list of reciprocal North Korean actions. As a substitute, the North promises to respond positively and invites the South to trust the good intentions of the North. This apparently is what the North considers a peace overture. North Korean strategists know these practical steps will be unacceptable. They offer themas a diversion. Iraq: The Military Council for Al-Anbar Revolutionaries (MCAR), a Sunni armed group, has publicly claimed responsibility for attacks against government forces since late December. At least 63 people were killed and another 41 more were wounded in fresh bloodshed. As in recent days, the focus of the violence was in Anbar. Comment: It is not possible to determine from open sources the authority or stature of MCAR. What is noteworthy is that the emergence of this group suggests a greater degree of organization of the non-jihadist Sunni tribal fighters than has been reported previously. It also suggests the tribes have an effective command and control structure for coordinating anti-government operations. The Sunni tribal militias might prove to be highly adept students of US special forces training. Egypt: The state-run Al Ahram newspaper put the unofficial voter turnout at just under 37% of registered voters. It projected a more than 98% win by the "yes" campaign in all regions, except for North Sinai. In North Sinai province, only 17 percent of the governorate's 223,533 registered voters cast their ballot, approving the charter 94.4 percent. The unofficial final results are that 98% of the voters approved the draft constitution. Thirty-seven percent of the registered voters cast ballots. Comment: In the NightWatch discussion and the feedback comments about the Bangladesh elections the most insightful commenters agreed that boycotting an election constitutes a vote. Unfortunately, there is no mechanism to count the number of those who vote by boycott. Even if non-voters are the majority, they disenfranchised themselves according to the rules of elected government. That implies that the majority's recourse is revolution. In most western states, some 15-20 percent of the registered voters decides the government. Egypt did better than that. The fact remains that most elected governments are not representative of the majority of the people or even the lectorate, only the majority of the voters. A majority of votes does not constitute a mandate to rule based on the will of the people. Most modern democracies are governments of the minority. South Sudan: Ugandan troops have been killed while fighting alongside South Sudan's army against rebels in South Sudan, Ugandan President Yoweri Museveni said on 16 January. Comment: This is the first time Uganda has admitted that its soldiers are engaged in ground combat in South Sudan. Credible numbers of fighters are not available. However, President Museveni said that at least 1,600 Ugandan soldiers were supporting the South Sudan government. Previously he denied that any Ugandans were involved in combat. Uganda is acting as the protector of South Sudan, but the price of the protectorate is rising.